This past Sunday West Edge Opera opened its Festival 2015 with As One, in the West Coast premiere of the recent opera by New York–based composer Laura Kaminsky, set to lyrics by Mark Campbell and Kimberly Reed. 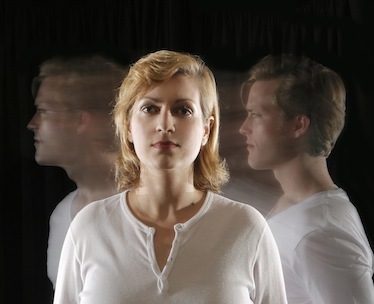 The chamber opera is inspired by filmmaker Reed’s own transition from a designated male child to a transgender woman. It was Reed’s documentary Prodigal Sons, which looked at her past as Paul McKerrow and the challenging process embarked on to become Kimberly Reed, that captured Kaminsky’s imagination and led to the project. The 70-minute opera is sung by two characters: Hannah Before and Hannah After. Baritone Dan Kempson sang Before and mezzo Brenda Patterson sang After. Though two separate individuals they were aided in their implied singularity by an uncanny physical resemblance. Blond, wholesome-looking and handsome, both singers sang their shared identity with convincing passion and clarity. The singers were always on stage together, Before and After were markers for a social and political perception of gender as much as for a life divided in two parts because of changed sexual identity. And it was clear that these two differently gendered identities lived and breathed together – “as one”. That this state is an on-going reality. At times the singers sang together wonderfully, Hannah After ornamenting the lyrics sung by Hannah Before with a warm and harmonic vocalese. The opera is clearly a political statement, but it’s done gracefully, through the personal revelations of the main character. The libretto by Mark Campbell and Kimberly Reed is very straightforward – a plain-spoken description of the character’s thoughts. Pivotal moments in the character’s life, from childhood to integrated adult, are each revealed in arias that move quickly from incident to incident. We learn things: about the confusions of an interior life as an individual follows a path that is radically different from socially determined ones, about learning to hear and commit to the interior voice and about the great diversity of life. We also learn, in a sweetly emphatic set of do’s and don’ts in the program, the verbal etiquette for addressing a transgendered person. The singers were supported by the Bay Area’s Friction Quartet, a string quartet that rendered Kaminsky’s music with authority and delicacy. Taija Warbelow’s viola solos were especially moving, echoing the timbre of the singers. And Kaminsky’s music lifted the libretto into an emotional realm that vivified what might have slipped into the documentary or the didactic. The stage setting had a black-box simplicity that suited the “chamber” quality of the opera. Risers encircled the musicians in a collection of rectangular “floors”, all on the same level. Behind them five overlapping screens were elegantly arranged, on which were projected Reed’s videos illustrating the action on stage. Like the libretto, the imagery was plain spoken, adding to a feeling of overall directness and therefore honesty in the scenes presented. Mark Streshinsky directed the white T-shirt and jeans–clad cast. Using the metaphor of a mirror to open the opera and an overall metaphor of symmetry throughout the opera’s action. Ten actors provided a mute dramatic chorus to the two Hannahs, moving props and action in the story. As part of the company’s commitment to moveable feasts, the production was held at Opera Metro’s Second Street venue in Jack London Square. Once again, the innovative and imaginative West Edge Opera, née the Berkeley Opera, provided a thoughtful and engaging production. The house was full and the audience was very pleased. Photo: Brenda Patterson (Hannah After) and Dan Kempson (Hannah Before).